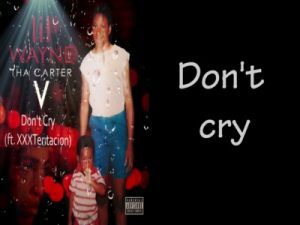 “Don’t Cry” the first song on Tha Carter V, features a chorus from the late XXXTENTACION. This song mainly focuses on Lil Wayne’s emotions as he discusses many difficult situations in his life. There is a smooth transition from the album’s intro, “I Love You Dwayne,” to this song, as we hear Jacida Carter (Lil Wayne’s mother) weeping before X tells her not to cry. We additionally have an amazing Don’t Cry – Lil Wayne Featuring XXXTENTACION ringtone which would empower you get ringtones out of your favorite songs. Download and install it on a call and let you enjoy it with every new incoming call.